Collaborators: J.M. Cortes (BioCruces), M. Gomez Bildarrain (Galdakao hospital), M. de Tommaso (Policlinico di Bari), E. Vecchio (Policlinico di Bari), J.M. Guerra Ramos (Hospital Santa Creu i Sant Pau, Barcelona), M. Vazquez (Barcelona Supercomputing Center), J. Saiz Rodriguez (U. Politecnica de Valencia), O. Camara (U. Pompeu Fabra), F. Montomoli (Imperial College, UK), J. Jansson (BCAM), A. Veneziani (Emory U. ), Y. Coudiere (INRIA-Carmen, Bordeaux), E. Vigmond (IHU-LIRyC, Bordeaux), S. Perotto (Milan Polytechnic). In the recent decades, the possibility to simulate complex problems in Biomedical sciences popularised the use of computational models in advanced clinical practice. Such models, known as in silico, are today a regular support for the investigative activity of medical doctors and life scientists, alongside the in vivo and in vitro experiments. Medical doctors can benefit from effective and reliable non-invasive, patient-specific, instruments to improve diagnosis and prognosis. In return, mathematical and numerical models can provide rigorous tools for quantitative analyses with a diagnostic and prognostic content, and patient specific simulations are made possible by integrating such models with data and medical images. As an example, scientific computing has been supporting research in cardiovascular science for almost three decades, and following the progress of medical imaging techniques, real computational domains reconstructed from imaging such as CT or MRI has become quite a standard in the community. As numerical simulations provide a relevant tool for understanding pathologies, designing new devices and optimizing therapies, the medical and social impact of this research is paramount. The objective of the research is to develop fast and reliable numerical methods to be used as a support in the clinical practice. Problems from biomedical research are extremely complex and challenging from the modeling viewpoint. Typically they are characterised by remarkable heterogeneities and multi-scale dynamics, both in space and time: a reliable predictive mathematical model should be able to soundly cope with these aspects. This activity is based on the collaboration with medical doctors, and the use of medical imaging and measurements to retrieve computational geometries, initial conditions, and physical parameters. Patient-specific simulations of Cortical Spreading Depression in the study of migraine. Migraine is a prevailing disease in present day population and our research aims at helping neurologists to have a better understanding of migraine and develop innovative intervention strategies. Cortical Spreading Depression (CSD) is a depolarization wave that originates in the visual region, propagates across the cortex, and has been proven a neural correlate of migraine aura, a perceptual disturbace preceding the headache. The geometry of the human cortex is highly individual, and is anticipated to impact the propagation of this depolarisation wave. Numerical simulation on real geometries can therefore help to identify correlates to assess risks and planning suitable countering strategies. We simulate the propagation of the depolarization wave on cortical geometries reconstructed from Magnetic Resonance Imaging (MRI): we incorporate tissue anisotropy information from Diffusion Tensor Imaging (DTI), a technique that, tracking the movement of water molecules, provides a proxy for the actual diffusivity of the cortex. We aim at analyzing brain geometries to understand their potential to support migraine and find common indicators pointing to predispositions for migraine, in order to differentiate between control and migraine patients, and guide targeted interventional strategies. Figure 1. DTI data and anisotropy assessment of a cortex (top). Propagation of Cortical Spreading Depression on the patient-specific geometry (bottom). Simulation by J.M. Kroos. 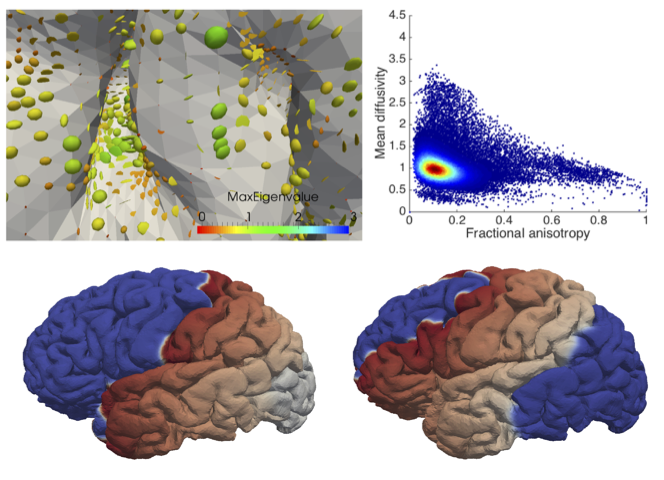 Modeling and simulation of Brain electrical and metabolic activity. Understanding the functioning of human brain is still one of the biggest challenges of science. The current knowledge is principally based on large data acquired with different functional imaging modalities such as EEG/MEG, fMRI, PET, optical tomography and NMR spectroscopy. Several dynamics coexist in a working brain, each more or less understood in its own: in particular, we highlight the electrophysiological activity of the neurons, the metabolic cycle of the neuron-astrocyte complex that provides the neurons with the energy needed to produce action potentials, the nutrient supply through the Brain Blood Barrier (BBB) from the capillaries that irrigate the cerebral tissue, and the blood flow in the circulatory system of the Circle of Willis. Each of these aspects has been individually the subject of a vast research activity in the past decades. In view of the complexity of the brain activity and the strong connection among such different dynamics, there is urgent need for new mathematical models to fill the missing links and integrate the advances in the various fields that study cerebral activity. We develop models that combine electrophysiology of a neuron-astrocyte complex, its energy metabolism, and the supply of nutrients and oxygen from capillaries. The main difficulty in coupling the two models resides in their dramatically different time scales (milliseconds for the electrophysiology and minutes for the metabolism). Figure 2. 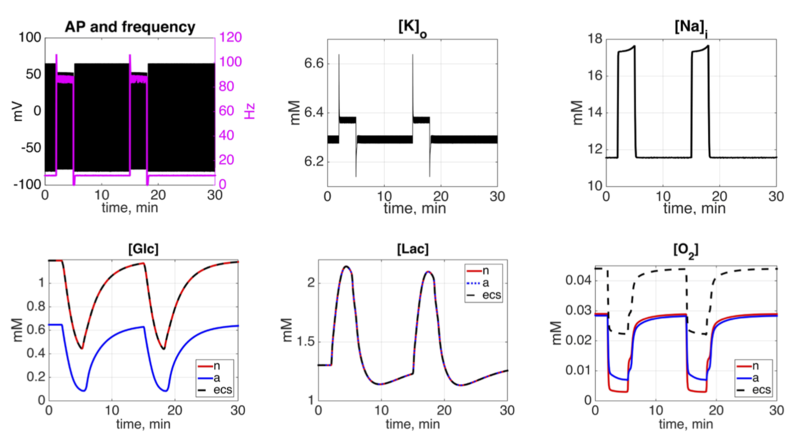 Electrometabolic dynamics during consecutive neural activations: time course of some electrophysiological (top) and metabolic (bottom) variables. Simulation by G. Capo Rangel. Computational models for endocardiac Radio Frequency Ablation (RFA). Ablative techniques based on RF energy are used to produce a safe and localized heating of target biological tissue. In recent years there has been rapid growth in the number of new medical procedures employing these techniques, accompanied by the emergence of new electrode designs and energy delivery protocols. However, many questions linger about the actual energy-tissue interaction dynamics in specific applications. 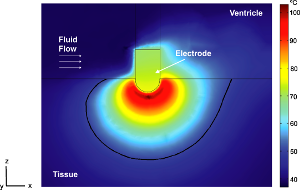 Our research focuses on developing computational models to study the electrical and thermal phenomena involved in endocardiac RFA, that can be used to both improve the efficacy and safety in the current clinical practice, and to propose technical improvements in designing more efficient and safer instruments. Figure 3. Simulation of temperature distributions in the cardiac tissue and blood after RF ablation. The solid black line represents the thermal damage border of the lesion. Simulation by A. González Suárez. 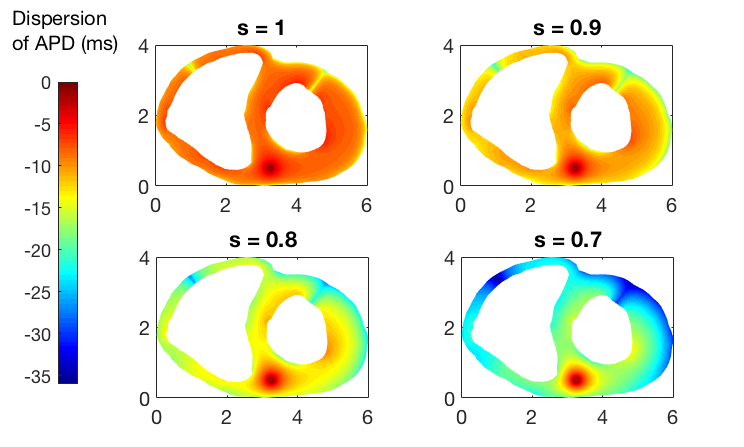 Fractional PDE based models of cardiac electrophysiology. The development of accurate simulation tools for electrical pulse propagation in biological tissue, such as cardiac muscle or neural tissue, must take into account both the anisotropic character and the highly heterogeneous structure of the medium. We investigate the use of fractional calculus tools to accurately describe the effects of high structural heterogeneity on the spreading of electrical signals and combine it with classical modelling techniques accounting for the anisotropy. Figure 4. Dispersion of Action Potential Duration (APD) on a cardiac slice with a Fractional Monodomain model. Simulation by N. Cusimano. Modelling human β-cell in healthy and diabetic patients. The study of ATP-sensitive K+ channels (KATP channel) has become the core of the medical investigation of neonatal diabetes. These channels play a fundamental role in the insulin secretion since they couple metabolism to electrical activity of the plasma membrane in the β-cell. Genetic mutations in the Kir6.2 subunits of the channels (KCNJ11) can result in both hypo- and hyperglycemia, as well as in neurological disruptions. The majority of the patients with these mutations are treated by oral therapy with sulphonylurea drugs, in very high doses. In order to improve the treatment, a exhaustive knowledge of β-cell nature from a physiological point of view is needed. We work on developing a mathematical model to simulate the dynamics of metabolites inside human β-cells, as well as the cell-cell coupling in pancreatic islets. Figure 5. Membrane potential of a 2x2x2 cube of beta-cells at 10mM glucose when the cells are uncoupled (left) and coupled (right). Simulation by I. Marinelli. Collaborators: A. Chiabai (BC3 - Basque Center for Climate Change), G. Puggioni (U. Rhode Island), L. Waller and L. Real (Emory U., Center for Disease Ecology), G. Pagnini (BCAM). Decision makers that base their choices on studies in disease ecology and conservation biology can benefit from supporting analytic tools for devising strategies in preventing and countering possible emergencies. Landscape is not an homogeneous structure and its peculiar features may significantly affect the temporal dynamics of a species living in it. 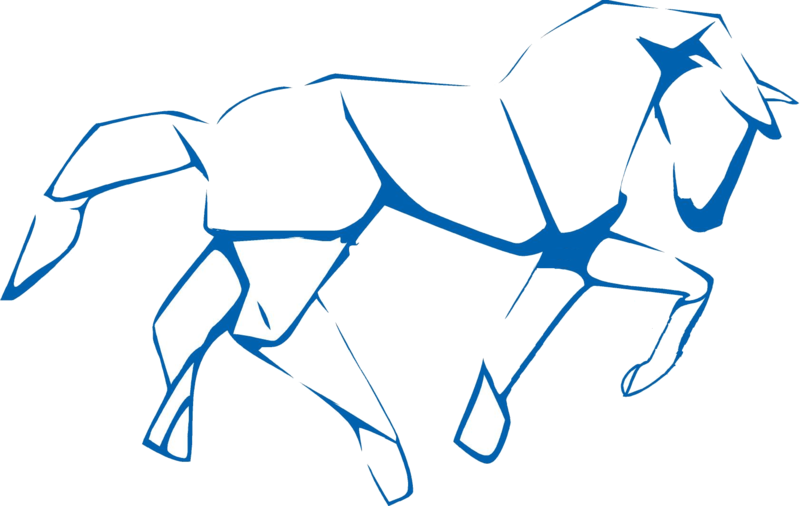 A proper mathematical description of the environment is therefore a crucial key, and one of the central aspects of our research focuses on studying the landscape and the habitat structure and how its heterogeneities influence the spread of infectious diseases and the dispersal of invasive species. By combining stochastic and deterministic methods, often based on the use of partial differential equation, our research takes into account the spatial component of the dynamics. Such combination of stochastic and deterministic methods responds to the urgency of incorporating available data into the model in order to enhance its adherence in the representation of the real system. Figure 6. Spread of raccoon rabies in NY state: computational mesh, numerical simulation and real data. Simulation by J.P. Keller and L. Gerardo-Giorda. Surveillance modeling. A crucial aspect in improving the efficacy of a targeted effort from public health authorities in contrasting an infectious disease outbreak resides in the possibility of identifying both areas and populations that are at increased risk of disease exposure. We develop models which combine both process-driven models and observational ones, learns from existing data and allows to identify computable quantities that can be used in risk assessment. By identifying sensible areas, it provides a supporting tool to decision makers to better allocate the always limited resources in this sector. Figure 7. Surveillance risk map for raccoon rabies in NY state. Simulation by L. Gerardo-Giorda and G. Puggioni. A mathematical model aims at capturing realistic aspects of the system it is trying to describe, and in general features a large number of parameters. This is particularly the case when modeling biological systems. Identifying the most important parameters of a model, along with their proper tuning, is thus a major challenge in mathematical modeling. In this direction, incorporating available data (experimental, medical, observational) is of paramount importance, albeit the latter are very often limited and loaded with uncertainty. Data assimilation (DA) strategies consist in the merging of measurements and simulations for improving the quality of data (noise filtering), the reliability of numerical simulations (uncertainty quantification and reduction) and generally the quality of information extraction from data and numerical results. Our group is currently working on a parameter estimation methodology of Bayesian type, that combines deterministic (PDE) and stochastic (SPDE) models, and on UQ techniques based on Monte Carlo simulations coupled with surrogate models. Figure 8. Dispersal of an invasive species in the Basque territory: population density mean and standard deviation at month 36 of invasion. Simulation by L. Gerardo-Giorda.